I was at the Oklahoma Museum of Natural History in March to look at their Apatosaurus material, so I got to see the newly-mounted baby apatosaur in the “Clash of the Titans” exhibit (more photos of that exhibit in this post). How much of this is real (i.e., cast from real bones, rather than sculpted)? Most of the vertebral centra, a few of the neural arches, some of the limb girdle bones, and most of the long bones of the limbs. All of the missing elements–skull, neural arches, ribs, appendicular bits–were sculpted by the OMNH head preparator, Kyle Davies. Kyle is one of those frighteningly talented people who, if they don’t have what they need, will just freaking build it from scratch. Over the years he has helped me out a LOT with the OMNH sauropod material–including building a clamshell storage jacket for the referred scapula of Brontomerus so we could photograph it from the lateral side–so it’s about time I gave him some props. 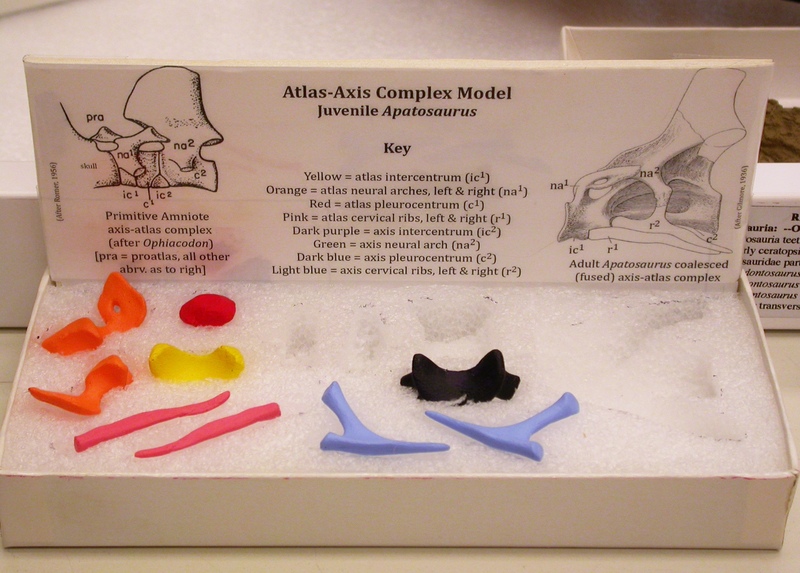 Case in point: this sweet atlas-axis complex that Kyle sculpted for the juvenile Apatosaurus mount. Most fish, amphibians, and other non-amniote tetrapods only have a single specialized vertebra for attaching to the skull. But amniotes have two: a ring- or doughnut-shaped first cervical vertebra (the atlas) that articulates with the occipital condyle(s) of the skull, and a second cervical vertebra (the axis) that articulates with the atlas and sometimes with the skull as well. Mammals have paired occipital condyles on the backs or bottoms of our skulls, so our skulls rock up and down on the atlas (nodding “yes” motion), and our skull+atlas rotates around a peg of bone on the axis called the odontoid process or dens epistrophei (shaking head “no” motion). 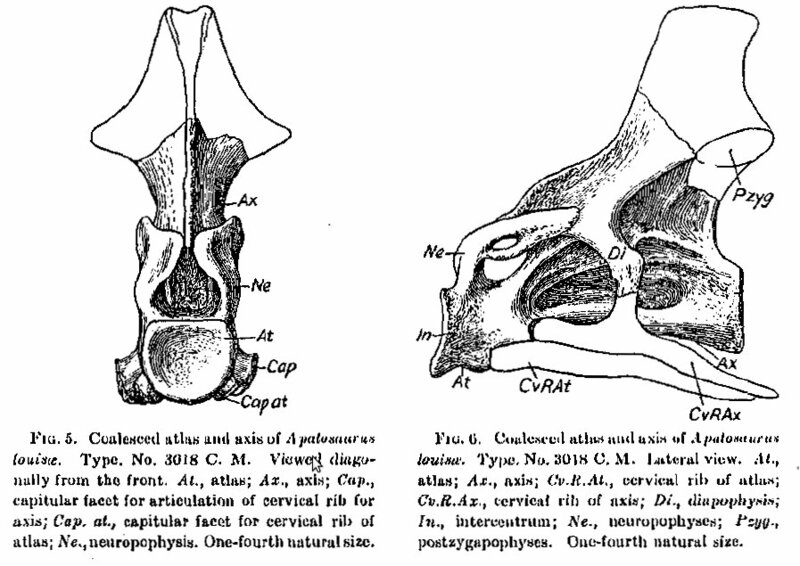 As shown in the photos and diagrams below, the dens of the axis is actually part of the atlas that fuses to the second vertebra instead of the first. Also, reptiles, including dinosaurs and birds, tend to have a single ball-shaped occipital condyle that fits into the round socket formed by the atlas, so their “yes” and “no” motions are less segregated by location. Anyway, the whole shebang is often referred to as the atlas-axis complex, and that’s the reconstructed setup for a baby Apatosaurus in the photo above. 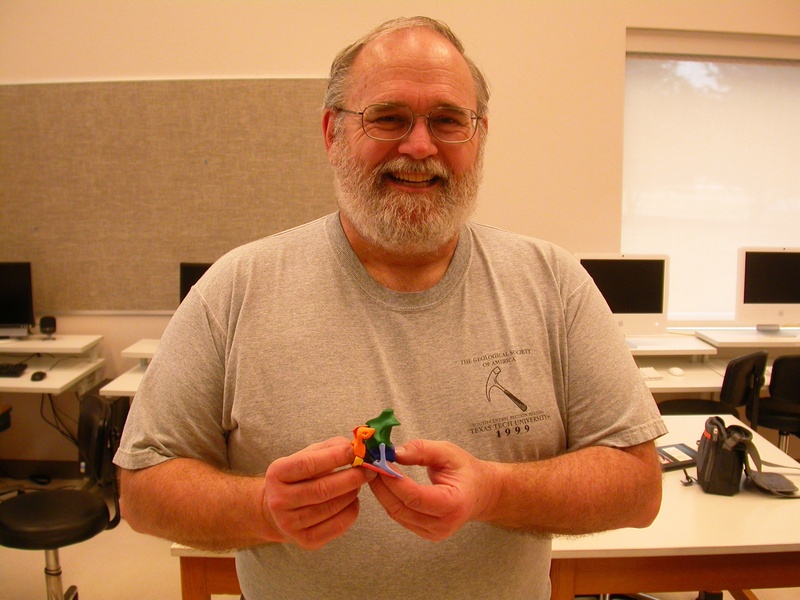 In addition to making a dull-colored one for the mount, Kyle made this festive version for the vert paleo teaching collection. Why so polychromatic? Because in fact he built two: the fully assembled one two photos above, and a completely disassembled one, some of which is shown in this photo (I had to move the bigger bits out of the tray so they wouldn’t block the key card at the back). I originally composed this post as a tutorial. But frankly, since Kyle did all of the heavy lifting of (a) making the thing in the first place, (2) making a color-coded key to it, and (d) giving me permission to post these photos, it would be redundant to walk through every element. So think of this as a self-study rather than a tutorial. Oh, all right, here’s a labeled version. 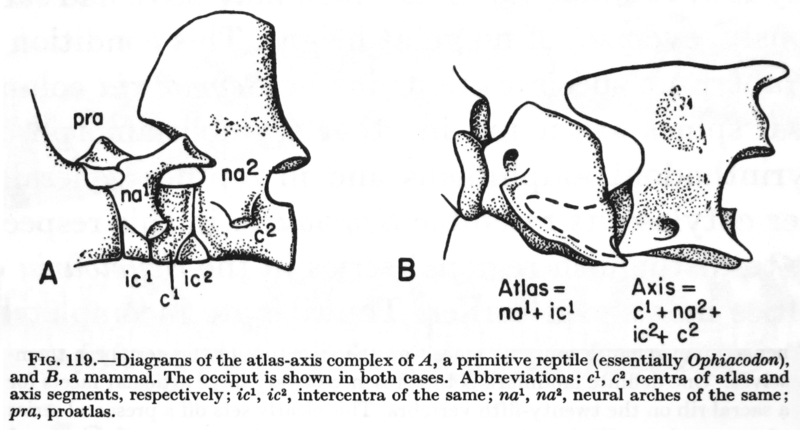 Note that normally in an adult animal the single piece of bone called the atlas would consist of the paired atlas neural arches (na1) and single atlas intercentrum (ic1), and would probably have a pair of fused cervical ribs (r1). Everything else would be fused together to form the axis, including the atlas pleurocentrum (c1), which forms the odontoid process or dens epistrophei (etymologically the “tooth” of the axis). Here’s the complete Romer (1956) figure from the key card, with a mammalian atlas-axis complex for comparison. Incidentally, the entire book this is drawn from, Osteology of the Reptiles, is freely available online. And here’s the complete Gilmore (1936) figure. Sorry for the craptastic scan–amazingly, this one is NOT freely available online as far as I can tell, and Mike and I have been trying to get good scans of the plates for years. Getting back on topic, single-headed atlantal cervical ribs have been found in several sauropods, especially Camarasaurus where several examples are known, so they were probably a regular feature, even though they aren’t always preserved. Also, as noted in this post, it is odd that in this specimen of Apatosaurus the cervical ribs had not fused to the first two vertebrae, even though they normally do, and despite the fact that the vertebrae had fused to each other, even though they normally don’t. Further demonstration, if any were needed, that sauropod skeletal fusions were wacky. For comparison to the above images, here is the atlas-axis complex in the synapsid Varanops, from Campione and Reisz (2011: fig. 2C). Those proatlas thingies are present in some sauropods, but that’s about all I know about them, so I’ll say no more for now. 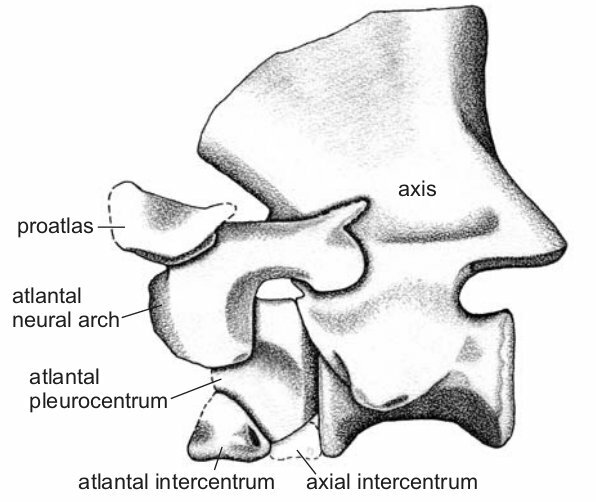 There is a good overview of the atlas-axis complex with lots of photos of vertebrae of extant animals on this page. Campione, N.E. and Reisz, R.R. 2011. Morphology and evolutionary significance of the atlas−axis complex in varanopid synapsids. Acta Palaeontologica Polonica 56 (4): 739–748. Gilmore, C.W. 1936. 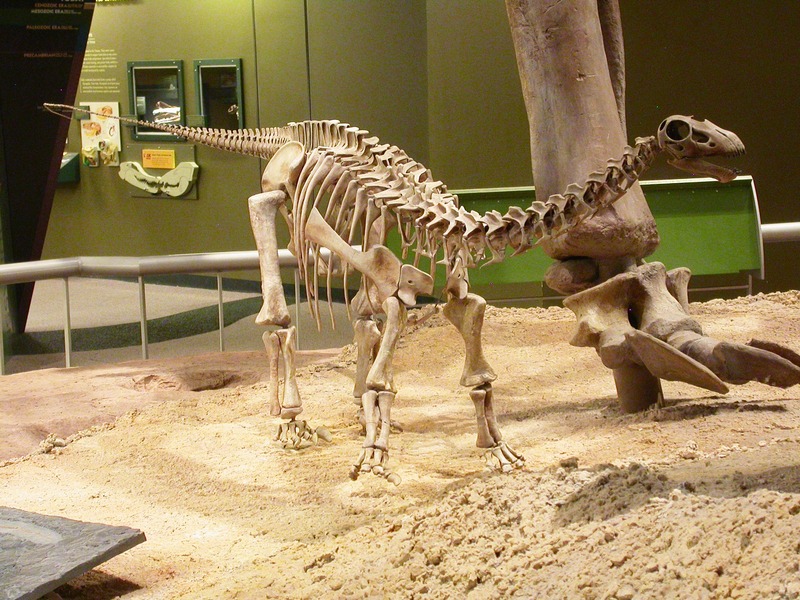 Osteology of Apatosaurus with special reference to specimens in the Carnegie Museum. Memoirs of the Carnegie Museum 11: 175-300. Romer, A.S. 1956. Osteology of the Reptiles. University of Chicago Press, Chicago. 772 pp. By deduction from contextual clues, I am compelled to conjecture that these osteoliths constitute the neck-bone that’s connected to the head-bone. Ah, er, I seem to have neglected to mention what the atlas and axis are. *chagrin* You got it, they are cervicals 1 and 2. I will amend the post. Ah, yes, but could they raise them above the horizontal position! Good post! it is about what i´m working right now, and will be helpful. I love the model made by Kyle Davies too. @anon: Trick question: they would have to get the neck into a horizontal position, first. Right. It’s not. The presence of fairly long cervical ribs* on the atlas and the fusion of the atlas and axis in CM 3018 are evidence that almost no motion could take place at the atlas-axis joint, unlike mammals, where there is a lot of rotation between atlas and axis. 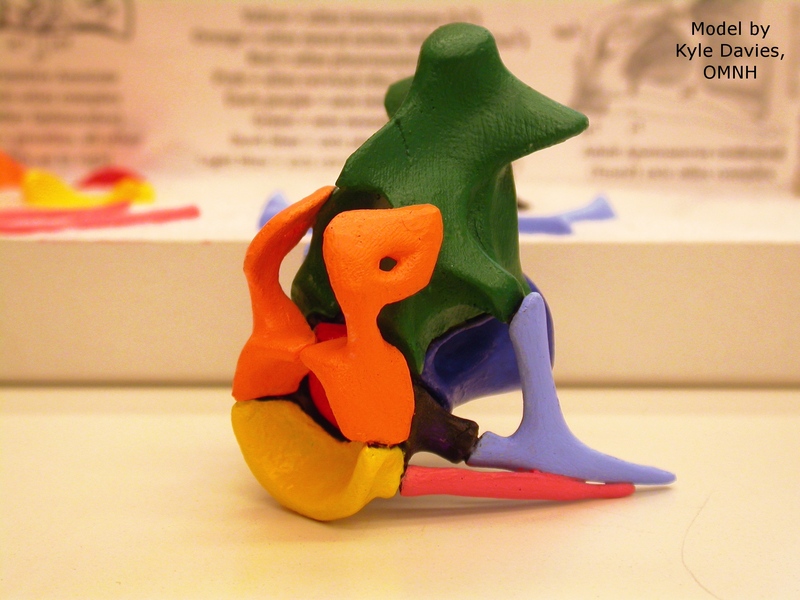 But whereas mammals can only rock our heads up and down on our dual occipital condyles, dinos had more of a ball-and-socket setup between the single occipital condyle the bony cup formed by the atlas. So the lack of movement between atlas and axis was not a problem. * Mammalian cervicals, including the atlas, have bicipital (two-headed) cervical ribs, but they’re super-short and they always fuse to the vertebrae, so we refer to them as transverse processes. But developmentally they are cervical ribs, the same as those in birds and sauropods.